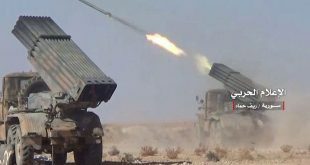 Provinces, SANA – As the army continues advancing in al-Zabadani city in Damascus Countryside, its units in other areas inflict more losses upon the terrorists, leaving many of them dead or injured and destroyed their equipment. An army unit, in cooperation with the Lebanese Resistance, went on advancing on central al-Zabadani city, establishing control over a number of building blocks in the al-Zahraa area and al-Gharbi neighborhood to the west of the city center, a military source told SANA on Sunday. A large number of terrorists were killed in the course of the army’s advance, including Mohammad Salem Ghaliyoun, a leader of one of the terrorist groups, and the terrorist Abdo al-Assaf. Other terrorists were captured. Yesterday, the army and the Resistance controlled a number of building blocks in Za’tout neighborhood and at the corniche roundabout in al-Zabadani city, located to the northwest of Damascus. The Army’s Air Force carried out on Sunday morning a series of airstrikes on concentrations and movements of ISIS terrorists in al-Qaryatain city in the countryside of Homs province, killing at least 30 ISIS members, most of them Saudis and Tunisians. A military source told SANA that two Saudi leaders in the terrorist organizations, nicknamed “Abu Hajar” and Abu Abdullah,” were among the terrorists killed in the airstrikes. The airstrikes also destroyed a rocket shells depot and 7 vehicles equipped with machineguns. Later, the source said that the Air Force also eliminated a number of ISIS terrorists, injured others, and destroyed their vehicles in Palmyra city, near a gas station to the west of the city, al-Sultanyeh, Abu Turaha, al-Tarfawi, Talbeseh, east of the quarries, and in the farms south of Palmyra. The Syrian Arab Army’s Air Force launched airstrikes on terrorists’ dens in al-Ziyara, Zaizoun and al-Zyadia in the northwest countryside of Hama province, killing many terrorists and destroying of their vehicles, weapons, and ammunition. Many terrorists were killed during concentrated strikes by the army on their hideouts in al-Zakom and al-Hamidia in the province’s northern countryside. 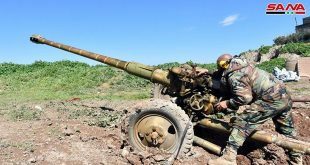 Army units in cooperation with Air Force targeted terrorists’ dens in al-Arbain village and south of Kafar Zita in the northwestern countryside, and in Attshan village to the north of Hama city, resulting in the death of many terrorists and the destruction of their weaponry and ammo. 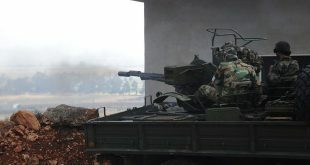 Units of the army and the armed forces, in cooperation with the popular defense groups, carried out on Sunday morning intensive operations against positions of Jabhat al-Nusra terrorists in the northern countryside of the coastal Lattakia province. 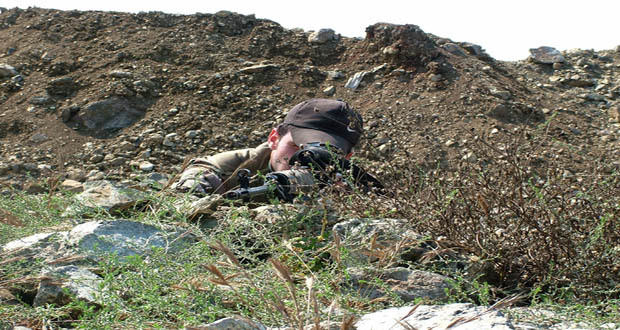 Terrorists’ supply routes in al-Rihaniyeh village near the border with Turkey were targeted. A car loaded with ammunition was destroyed in the village, in addition to destroying a depot containing huge amounts of explosive devices, shells and explosives. Many of the terrorists were killed and scores were injured in the operations. 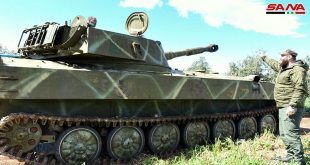 In the southern province of Daraa, an army unit targeted terrorists’ movements in Simlin town in the northern countryside, killing and injuring a number of them and destroying a vehicle with all weapons and ammunition carried on board it. Another army unit clashed with an armed terrorist group that tried to infiltrate from the villages of Rakhm and al-Karak al-Sharqi in the eastern countryside of the province towards the village of Skaka, located in the neighboring Sweida province. All members of the terrorist group were killed during the clashes and their weapons, ammunition and equipment were destroyed. Meanwhile, the terrorist organizations acknowledged on their social media pages the killing of a number of their members, among them the leader of the so-called Ansar Mohammad Battalion” who was nicknamed Malek Mahmoud Shlash. Army units eliminated a number of terrorists from “Jaish al-Fatah” terrorist group and destroyed their vehicles in Abu al-Duhour area and its surroundings in the southeast countryside of Idleb. Other army units in cooperation with the Air Force targeted with intensive strikes terrorists’ gatherings and hideouts in Qarqur and al-Mashbak in Idleb’s southwestern countryside, killing many terrorists and destroying their weapons and ammunition. The army also killed terrorists from Jabhat al-Nusra and Jaish al-Fateh in Muhambel, east of Kansafra, Tal al-Kafir, Safuhen, Frikeh, Kafr Awid, and Jisr al-Shoughur city in the province’s countryside. A military source said that an army unit carried out concentrated strikes on hideouts of terrorists in the surroundings of Jabata al-Khashab village in the northern countryside of Quneitra province, killing a number of terrorists and destroying their weapons and equipment. A military source told SANA that army units eliminated many terrorists in the surroundings of the Air Force Academy, the Scientific Research Center, and al-Nairab Airport and in al-Ashrafiye, Sleiman al-Halabi, and Bustan al-Basha in Aleppo and its countryside. An army unit made significant advance after taking 5 blocks in the neighborhood of Suleiman al-Halabi, the new advance is of great important as it gets the army units closer to Suleiman al-Halabi drinking water facility to provide water to the city locals.